From expensive meal plans to housing and classes, college requires tons of cash. Earning money while in school is important, no matter what your financial situation. That’s why we’ve not only shared tips and lifehacks for cashing in online, but we’ve also made this special guide for earning money while living on campus. Let’s get started. Here are five awesome ways to earn extra cash. Before looking anywhere else, pursue work-study opportunities. Most universities offer well-paying jobs for students around campus. Whether you’re sweeping classrooms, shelving books at the library, or lifeguarding at your campus pool, you’ll find something that fits your skillset. Another way to earn cash on campus is by tutoring your classmates. If you excel in certain subjects, contact your school’s tutoring program or reach out to your classmates directly. Many of your classmates need help with their studying skills or struggle in particular areas. If you’re patient and confident in your ability to teach, tutoring is an excellent way to make a little extra cash. 3. Sell your class notes. If tutoring isn’t your thing, selling your notes can be just as lucrative. If anybody has every told you that you take lots of notes, check out some online resources for selling them, like NexusNotes or NoteUtopia. Many universities also have note exchange programs, where you’ll get paid to take notes in classes you’re already taking. What a great system — it’s almost too easy. While this may seem unconventional, babysitting or nannying is another way to earn cash. Try posting your services on campus billboards or your university’s Facebook page. Professors and students with kids are always on the lookout for good childcare, and you could be just the answer to their prayers. 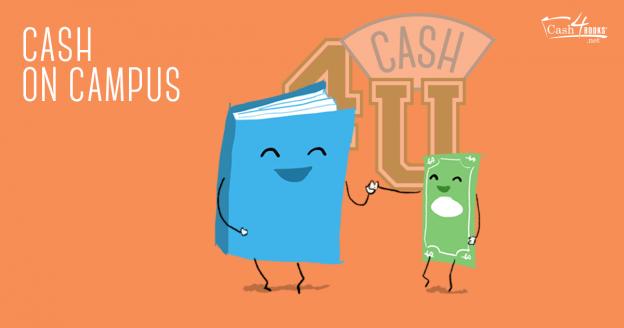 Last but not least, sell your old textbooks for cold, hard cash with Cash4Books. Since you’re in college, you need to buy textbooks each semester anyway, so selling them when you’re done is a no-brainer. Instead of getting in-store credit at places like Amazon, Cash4Books gives you cash fast to do with what you will. Another key tip is to buy up old textbooks from your classmates or thrift stores. When you sell more books, you’ll get more cash. Now you have the tips to make some major money — all while you’re still in school. Use our advice and snag that cash! This entry was posted in Lifehacks and Tips and tagged college students, college tips, make money, tips on October 12, 2016 by Jim McKenzie Smith.